Hansel J. Otero, MD, is an attending radiologist and Director of International Pediatric Radiology Education and Outreach at Children's Hospital of Philadelphia. 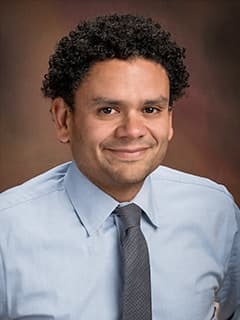 Dr. Hansel Otero is the Director of International Pediatric Radiology Education and Outreach in the Department of Radiology at Children’s Hospital of Philadelphia (CHOP). He joined CHOP Radiology in 2017 as an attending pediatric radiologist and Assistant Professor of Radiology. He is a member of the Center for Pediatric Clinical Effectiveness at CHOP with research emphasis in this field as it pertains to radiology. He is also a member of both the Section on Genitourinary Imaging and Section on Cardiovascular and Lymphatic Imaging. Dr. Otero completed two consecutive fellowships in management at the Harvard Medical School in Boston. The first one was an Administration Fellowship at Gill Management and Hospital and the second one a Radiology Management fellowship at the Department of Radiology at Brigham and Women’s Hospital. He completed Diagnostic Radiology residency in 2013 at Tufts Medical Center, Tufts University Medical School in Boston. In 2014 he completed his pediatric radiology fellowship at Children’s Hospital of Philadelphia and then joined the Department of Diagnostic Imaging and Radiology at Children’s National Medical Center in Washington, D.C.
From 2002 to 2005, prior to his radiology career, Dr. Otero practiced medicine in Venezuela and as an emergency response physician with Doctors without Borders/Médecins Sans Frontières (MSF) in Liberia, Sudan, Angola, Pakistan and Yemen. He still serves as a teleradiologist for MSF. Dr. Otero has continued his international outreach in pediatric radiology education and participated in educational missions to Haiti, Ghana and Ethiopia. He has served as the Rad-Aid International Pediatric Radiology Program Manager for Latin America and Africa and is a member of the CHOP Radiology RAD-AID chapter. Dr. Otero was recently appointed as the Director of Outreach for the World Federation of Pediatric Imaging (WFPI). Dr. Otero is a Global Health Scholar of the Center for Global Health (CGH), Perelman School of Medicine, and a Senior Fellow of the Leonard Davis Institute of Health Economics at the University of Pennsylvania. He has published on some of his international outreach activities, too. Barrera CA, Otero HJ, White AM, Saul D, Biko DM (2018 Oct 29). Image Quality of ECG-Triggered High-Pitch, Dual-Source Computed Tomography Angiography for Cardiovascular Assessment in Children. Current Problems in Diagnostic Radiology: pii: S0363-0188(18)30217-2. Doi: 10.1067/j.cpradiol.2018.10.006. PMID: 30472138. Otero HJ, Cardillo F, Duffy E, Kaplan SL (2018 Sep 15). The Cost-Estimation Department: A Step Toward Cost Transparency in Radiology. J Am Coll Radiol., pii: S1546-1440(18)30981-5. doi: 10.1016/j.jacr.2018.07.033. PMID: 30227950. Epub ahead of print. Otero HJ. Crowder L: Imaging Utilization for the Diagnosis of Appendicitis in Stand-Alone Children's Hospitals in the United States: Trends and Costs. J Am Coll Radiol. 2017 May;14(5):603-608. doi: 10.1016/j.jacr.2016.12.013. Epub 2017 Feb 17. Otero HJ, Chamber JD, Bresnahan BW, Kamae MS, Yucel EK, Neumann PJ: Medicare's National Coverage Determinations in Diagnostic Radiology: Examining evidence and setting limits. Academic Radiology 19(9): 1060-5, 2012. Fang CH, Otero HJ, Greenberg D, Neumann PJ: An Overview of Cost-Utility Analyses in Diagnostic Laboratory Tests. Value Health 14(8): 1010-8, Dec 2011. Otero HJ, Rybicki FJ, Greenberg D, Mitsouras D; Mendoza JA, Neumann PJ: Cost-Effective Diagnostic Cardiovascular Imaging: When Does It Provide Good Value for the Money? International Journal of Cardiovascular Imaging 26(6): 605-12, Aug 2010. *Khosa F, Otero HJ, Prevedello LM, Rybicki FJ, Di Salvo DN: Imaging Presentation of Venous Thrombosis in Patients with Cancer. American Journal of Roentgenology 194: 1099-1108, Jul 2010 Notes: *Co-First author. Steigner MS, Mitsouras D, Whitmore AG, Otero HJ, Wang C, Buckley O, Levit NA, Hussain AZ, Cai T, Mather RT, Smedby O, DiCarli MF, Rybicki FJ: Iodinated Contrast Opacification Gradients in Normal Coronary Arteries Imaged with Prospectively ECG-Gated Single Heart Beat 320-Detector Row Computed Tomography. Cardiovascular Imaging 3(2): 179-186, Mar 2010. Souza FF, Otero HJ, Erturk SM, Rybicki FJ, Ramaiya N, Van den Abbeele AD, Di Salvo DN: Venous thrombosis in an outpatient oncology center: distribution, type, and co-morbidities. Ultrasound Quarterly 25(3): 145-50, 2009. Otero HJ, Yap JT, Patak MA, Erturk SM, Israel DA, Johnston CJ, Sakellis C, Rybicki FJ, Van Den Abbeele A, Ros PR: Evaluation of Low Density Neutral Oral Contrast in PET/CT for Tumor Imaging: Results of a Randomized Clinical Trial. American Journal of Roentgenology 193(2): 326-332, Aug 2009. Steigner MT, Otero HJ, Cai T, Mitsouras D; Nallamshetty L, Whitmore AG, Ersoy H, Di Carli MF, Rybicki FJ: Narrowing the Phase Window in Prospectively ECG-Gated Single Heart Beat 320-Detector Row Coronary CT Angiography. International Journal of Cardiovascular Imaging 25(1): 85-90, Jan 2009. Rybicki FJ, Otero HJ, Steigner ML, Vorodiof G, Nallamshetty L, Mitsouras D, Ersoy H, Mather RT, Judy PF, Cai T, Coyner K, Schultz K, Whitmore AG, Di Carli MF: Initial evaluation of coronary images from 320-detector row computed tomography. International Journal of Cardiovascular Imaging 24(5): 535-46, 2008. Otero HJ, Rybicki FJ, Greenberg D, Neumann PJ. Radiology: Twenty Years of Cost Effectiveness Analysis in Medical Imaging: Are We Improving? Radiology 249(3): 917-25, Dec 2008. Otero HJ, Erturk SM, Ochoa RE, Ondategui-Parra S, Rybicki FJ, Ros PR: Intestinal Obstruction: Trends in Imaging Utilization and Their Influence on Rising Hospital Bills. Emergency Radiology 15(5): 317-23, Sep 2008. Otero HJ, Ondategui-Parra S, Erturk SM, Ochoa RE, Gonzalez-Beicos A, Ros PR: Imaging utilization in the management of appendicitis and its impact on hospital charges. Emergency Radiology 15(1): 23-8, Mar 2008. Otero HJ, Rybicki FJ: Reimbursement for chest-pain CT: estimates based on current imaging strategies. Emergency Radiology 13(5): 237-242, Feb 2007. Otero HJ, Erturk SM, Ondategui-Parra S, Wong S, Ros PR: Molecular imaging programs in the US: results of a national survey. Academic Radiology 14(2): 125-136, Feb 2007. Otero HJ, Erturk SM, Ondategui-Parra S, Ros PR: Key criteria for selection of radiology residents: results of a national survey. Academic Radiology 13(9): 1155-1164, Sep 2006. Huhn GD, Brown J, Perea W, Berthe A, Otero H, Libeau G, Maksha N, Sankoh M, Montgomery S, Marfin A, Admassu M: Vaccination coverage survey versus administrative data in the assessment of mass yellow fever immunization in internally displaced persons. Vaccine 24(6): 730-7, Feb 2006. Bandarkar A, Otero HJ: Ultrasound Diagnosis of Median Arcuate Ligament Syndrome (MALS): A Single Institutional Experience. 7th International Pediatric Radiology Conjoint Meeting & Exhibition, Chicago, Illinois 2016 Notes: Scientific Exhibit. Allen ST, Otero HJ, Kirkorian AJ, Whitehead M: When the Pediatric Dermatologist Calls: A Collaborative Guide to Dermatologic Diagnoses that Require Imaging. Radiological Society of North America National Meeting, Chicago, IL November 2016 Notes: Educational Exhibit. Smitthimedhin A, Otero HJ, Whitehead MJ: MRI Determination of Normal Volumes for the Upper Airway and Pharyngeal Lymphoid Tissue in Preterm and Term Infants. 60th Annual Meeting & Categorical Course of The Society for Pediatric Radiology, Vancouver, BC, Canada May 2017 Notes: Oral Presentation (Accepted for presentation). Smith B, Otero HJ, Cielma T, Bandarkar A: Sonographic Evaluation of Diaphragmatic Motion: A Practical Guide to Performance and Interpretation. 60th Annual Meeting & Categorical Course of The Society for Pediatric Radiology, Vancouver, BC May 2017 Notes: Educational Poster (Accepted for presentation). Cerrolaza JJ, Otero HJ, Yao P, Biggs E, Ardon R, Jago J, Peters CA, Linguraru MG: Semi-Automatic Assessment of Pediatric Hydronephrosis Severity in 3D Ultrasound. Society of Photo-Optical Instrumentation Engineers (SPIE) Medical Imaging 2016 Notes: Oral presentation. Otero HJ, George AM, Cerrolaza J, Biggs E, Jago J, Linguraru MG: Feasibility and Quality determinants of 3D Ultrasound in Children with Hydronephrosis. Radiological Society of North America National Meeting, Chicago, IL November 2016 Notes: Scientific Poster Presentation. LeBedis CA, Rosenkrantz AB, Otero HJ, Decker SJ, Ward RJ: Contrast Reaction Training in US Radiology Residencies: A COARDRI Study. Radiological Society of North America National Meeting, Chicago, IL November 2016 Notes: Oral Presentation. Cerrolaza JJ, Otero HJ, Biggs E, George AM, Yao PH, Ardon R: Quantitative 3D Ultrasound Imaging in Pediatric Hydronephrosis. Radiological Society of North America National Meeting, Chicago, IL November 2016 Notes: Oral Presentation. Bhatia A, Otero HJ, Colafati G, Loomis J, Carducci C, Parikh AK, Whitehead MA: Imaging Findings in Typical and Atypical Central Nervous Infections during Fetal Development and Childhood. Radiological Society of North America National Meeting, Chicago, IL November 2016 Notes: Educational Exhibit. Martin J, Mathison D, Mullan P, Otero HJ: Secondary Imaging for Suspected Appendicitis with Equivocal Ultrasound: MRI vs CT. Eastern Society for Pediatric Research Annual Meeting, Philadelphia, PA March 2016 Notes: Oral presentation. Otero H. Pediatric Body MR Imaging: Challenges and Strategies for Success. 25th Annual Meeting of the SMRT (Society for MR Radiographers & Technologists), a Section of the ISMRM (International Society for Magnetic Resonance in Medicine). Singapore, May, 2016. Otero H. Rising Utilization of Magnetic Resonance Imaging in the Management of Pediatric Appendicitis in the United States: An Update Using a Large Administrative Database. Scientific Paper. 7th International Pediatric Radiology Conjoint Meeting & Exhibition, Chicago, Illinois, May, 2016. Otero H. Imaging Utilization Patterns for the Diagnosis of Appendicitis in Stand-Alone Children's Hospitals in the United States: an update of trends and costs. Scientific Paper. 7th International Pediatric Radiology Conjoint Meeting & Exhibition, Chicago, Illinois, May, 2016. Otero H. Rising Utilization of Magnetic Resonance Imaging in the Management of Pediatric Appendicitis in the United States: An Update Using a Large Administrative Database, 7th International Pediatric Radiology Conjoint Meeting & Exhibition, Chicago, Illinois, May, 2016. Otero H. Emergent MRI for Suspected Pediatric Appendicitis with Equivocal Ultrasound Results, 7th International Pediatric Radiology Conjoint Meeting & Exhibition, Chicago, Illinois, May, 2016. Otero H. "Another Time, Another Space", The Virtual Journal Club, Radiology Research Alliance Task Force, Association of University Radiologist (AUR) Annual Meeting, San Diego, CA, Mar, 2016. Otero H. "Building Pediatric Radiology Capacity in Ghana", RAD-AID Conference World Health Organization (PAHO) Headquarters, Washington, DC, Nov, 2015. Otero H. "Introduction to Pediatric Radiology", invited lecturer: 12-hour series: ultrasound of the brain, bowel - pyloric stenosis, intussusception and appendicitis, newborn abdominal masses, fractures, foreign bodies, and tonsils. Fluoroscopic evaluation of the esophagus and urinary tract, how to perform CT angiography in children, and basics of Fetal MR physics. Radiology Department, Korle Bu Teaching Hospital, Accra, Ghana, May, 2015. Otero H. "WFPI Plenary Session: International Pediatric Radiology Outreach", Society for Pediatric Radiology Annual Meeting, Bellevue, WA, May, 2015.